The news on marijuana and the new marijuana laws are – to say the least – confusing. Marijuana laws in Washington State – who can keep track of them? To understand fully the current state marijuana laws, you really must be a trained and experienced criminal defense attorney staying abreast of week-by-week marijuana legislation developments. Despite the many changes in the pot laws, one inescapable fact remains. You can still be arrested and charged with possession, sale, cultivation, or distribution of any amount of marijuana for any reason under federal law, and if that happens, you’ll need to contact an experienced Seattle marijuana attorney likeKevin Trombold promptly. Can I smoke pot on the patio, balcony, or deck of my apartment or house? People who smoke marijuana on their outdoor property will not be subject to a ticket. However, it is possible that a person smoking on an apartment balcony could be contacted by police if a neighbor complains about the odor (but even then, no citation will generally be written). Can I smoke pot in my hotel room? It depends on the hotel. Hospitality businesses can set their own rules regarding permission to smoke pot in a room. Obviously, this cannot be done in a regular non-smoking unit. The Washington Lodging Association states that there aren’t any particular policies regarding this issue, although many hotel owners say they would take action if another guest complained about the smell. And for those frequent flyers of the King County Jail, more commonly referred to as Hotel King County, no drugs allowed. Can I carry pot at Sea-Tac Airport? Yes, but it’s kind of pointless. You cannot smoke it on airport grounds, nor can you carry it onto an aircraft or pack it inside your luggage. So the situations are limited when this would apply – except perhaps if you’re just dropping someone off inside the airport or are a homeless person trying to use a warm bathroom. Can I carry pot on a train or boat? Amtrak is regulated by the federal government, so pot is still illegal on its trains. And since all navigable waterways fall under the auspices of the U.S. Coast Guard, federal law applies on all watercraft as well. If you have received a charge with a crime involving marijuana, contact the experienced attorneys at the Law Offices of Kevin Trombold quickly. NOW THAT POT IS LEGAL, WHEN SHOULD YOU DRIVE? Recreational marijuana is legal in Washington, but with certain restrictions. One of these restrictions involves driving while under the influence of marijuana. A level of 5 nanograms of THC per milliliter of blood classifies an individual as officially impaired; meaning that anyone found to be driving with this amount of THC or more in their bloodstream can be arrested on DUI charges. Although some marijuana “experts” say that almost all traces of marijuana disappear from the body a few hours after consumption, there is little data upon which pot smokers can draw to estimate whether they are legally impaired under the new law. And you can bet that law enforcement officers throughout the state of Washington will be eager to test drivers they pull over if there’s even a hint of marijuana use in evidence. As of now, there’s no consumer device which can measure THC content in the blood (much like a breath tester for alcohol consumption does) before getting behind the wheel. So it’s wise to avoid putting yourself into a position where an officer can take you into custody and force you to take a blood test – much less have the opportunity to charge you with driving under the influence and book you into jail. Each item must be prominently labeled as containing marijuana. Each item must be tested for THC potency. Marijuana derivatives must be spread evenly throughout the product. Processing facilities must pass a state-sanctioned inspection. Processors must submit a photo of the item, complete with packaging and labels, for state approval. If you are charged under the state marijuana law with possession of more than one ounce of pot or with the illegal sale of marijuana, contact the Law Offices of Kevin Trombold promptly. Since January 2013, there is no state law penalizing the recreational marijuana use of up to one ounce of pot. Marijuana use in public is illegal like it has been, and a conviction is punishable with a $100 fine. If you are charged under the state marijuana law with possession of more than one ounce of pot or with the illegal sale of marijuana, contact the Law Offices of Kevin Trombold propmtly. The illegal sale of marijuana is still a felony in Washington state, along a conviction can be punished by a sentence of five to ten years in a state prison. Any type of criminal charge can ruin your reputation and life unless you find the right criminal defense attorney. Kevin Trombold, an experienced and knowledgeable criminal defense attorney and his legal team work in-depth with their clients to investigate cases and protect their rights. 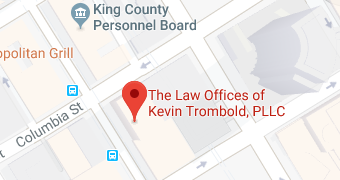 With more than 20 years of experience and a reputation for legal excellence, which is respected by judges, peers, and prosecutors in the Seattle area, defense attorney Kevin Trombold routinely wins not guilty verdicts, reduced charges, and dismissals. Reach out to us by giving us a call at 206-382-9200 for a confidential consultation.